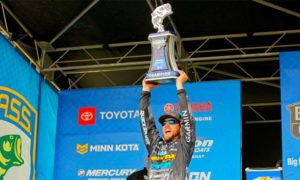 First Bassmaster Elite Series win for Drew Benton — congrats dude! 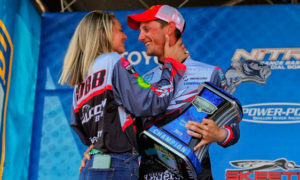 Here’s how he brought it on home at Lake Travis, TX. 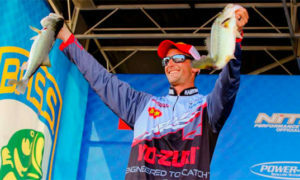 > “The first morning of practice I felt like the shad spawn would be going on. At the first marina sure enough, the shad were spawning and a lot of fish were schooling…. I started running that deal, but caught a lot of little fish. I didn’t know if I could find any quality fish, but it was just a matter of finding deeper main-lake marinas. Or ones really close to the main lake. > He was fishing about 3/4 of the way up the lake where the water was less clear. 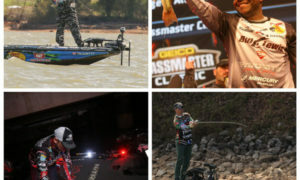 > “The water temp when we started practice was in the low to mid-70s, but the first day of the tournament it was 79 degrees — the shad weren’t doing it any more. But some big bass were staying around there because they were conditioned to that bite. 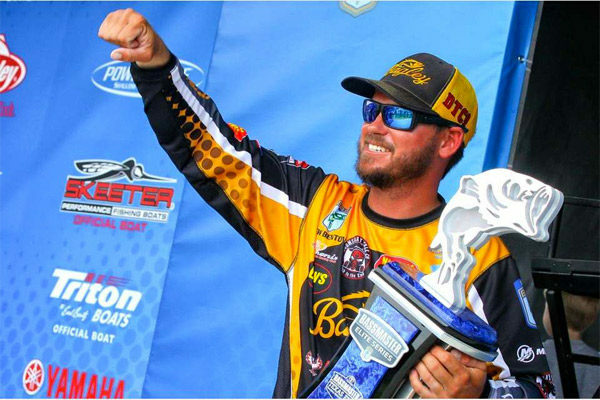 > “I caught a big one off the first 2 marinas, then I scrambled around — caught a couple flipping, a couple on top. I kind of jumped around and caught what I caught. > “The 2nd day I started at the marinas and didn’t have anything. My best 5 were like 6 lbs. > “My roommate had told me he’d gotten some bites later in the day on topwater. I ran that all day. I found the topwater bites were not around marinas but were on isolated rock — with a good 45-degree bank or a flat bank. Big boulders and chunk rock 4-8′ deep. 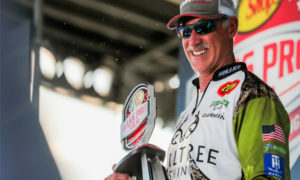 > “Day 3 I thought I had a solid gameplan, but I had a 3rd marina I hadn’t fished yet in the morning and I knew it had some big ones. I pulled in there, the shad were spawning, and the big ones were blowing up on them. I left out of there with 17-18 lbs. I was jacked — I still had 2 littles ones and all day to fish my primary deal. > “But the later it got, the more boats got on the water. Every pocket I’d gotten bit in there was a party going on or big ski boats muddying up the bank. It wasn’t happening for me — I could not get bit. Toward the end of the day, I started running the same type of cover but in protected pockets, and I was able to cull twice. > “Day 4 I figured that if we had all this boat traffic, I’d run pockets that were not on the main lake. But when I got in [day 3] I was assessed a 15-minute penalty at the start of day 4…for falling out of the boat and stepping on the dock. It made me nervous because I was doing all my damage first thing in the morning. 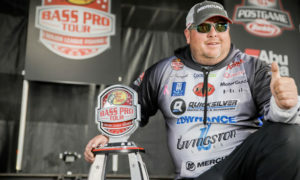 > “I was fishing [that early spot] with Marty Robinson and called him [that night about it] He said, ‘You have an opportunity to win so I’m going to stay out of there. That was huge of him — I really appreciate it. > “When I got there it was raining. A few fish were schooling but none of the big fish were doing their thing. I fished through it an hour…nothing. But then every now and again I’d catch a fish on 6” Nichols Flutter Spoon, pitching on slips. I caught a 4-10 and…had 1 more bite on it. > Close to 9:00…still kind of drizzling rain…running main-lake stuff I hadn’t fished with cloud cover…. Wasn’t happening. Pouring rain…picked up a swimbait, didn’t think anything would find a topwater. 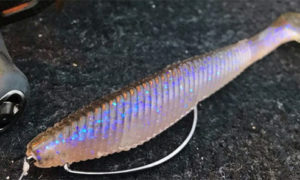 > Bagley Knocker B (shad — pic shows bluegill cuz he is out of shad) in the marinas. Mixed in a clear walking bait when it was high-sun and slick. 7′ 1″ H Phenix Feather Rod, Lew’s Magnesium Reel (7.5), 65-lb Seaguar Smackdown braid. > 6″ Nichols Mini Magnum Flutter Spoon (gizzard). “The deeper [the marina], the better. The deepest was 110′, the shallowest was 60′. The fish were suspended 5-15′ down. 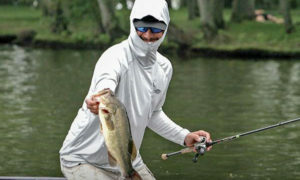 With the deeper water, the shad stayed there all day.” 707 H Phenix MBX Rod, same reel, 20-lb Seaguar InvizX fluoro. > “I also mixed in Doomsday Laggin’ Dragon (shad). It’s shaped sort of like a Senko — you throw it out and twitch it…it falls, it flutters…. It sinks under the smaller fish.” TX-rigged, 4/0 Owner EWG Worm Hook, 7′ 1″ H Phenix Feather Rod, 15-lb Seaguar InvizX fluoro.